Grades K and up. Europe's 2003 game of the year! Develops logic and spacial perception while kids learn to be tactical. 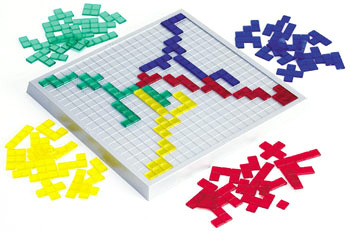 Players take turns placing pieces on their board, each starting from their corner. Each new piece must touch at least one other piece of the same color, but only at the corners! The goal is to get rid of all your pieces. The game ends when all players are blocked from laying down any more of their pieces. Includes one gameboard with 400 squares, 84 game pieces in four bright translucent colors, and an instruction guide. Why did I wait so long to play this? It's so simple to learn and easy to play. Wish I would have won though. I played this with my wife and some friends from Ukraine that are now US citizens. They taught us the rules in 20 seconds. After a few games, I let my 9 year old play and HE beat the other 3. The game does require some skill and the ability to look ahead a move or 2, but it is not so advanced that young kids will lose every time, as my son proved. I think this is a great family game for all ages. Takes a few minutes to learn, almost an age can play it. Yet at the same time it takes the ability to think 4-5 turns ahead to win. A fun, addicting game. best played with 4 players. If you want to play with two, get the travel edition. Great for kids to play with parents- watch out Mom and Dad- the kids may beat you without you even "letting" them. Great game for kids and families that love to play games! We gave this game to my 8-yr-old nephew for the holidays and love to see his deductive reasoning as he decides his moves and thinks ahead in the game. One of the best abstract strategy games for 4 people. The game takes a minute to explain and is popular with almost any group. Young, old, men and women all get into this game and want to play again immediately after their first try. Great Family Game! Easy for children to learn. Great strategies to this game for such a simple game that children can learn. Simple tile-laying game that is very tactical but also has a small element of strategy to it. Simple rules and colourful components make it easily accessable. A fun game. The only issue is that you really need four people to play the game. There is a travel edition if you want to play with two players. Highly recommended for people of all ages. Teaches great strategy and planning skills. Blokus is an easy-to-learn abstract game with symmetrical player positions - that is: there is no theme and everyone has the same possibilities at the start of the game. What I really like about Blokus is the feeling of claiming territory and yet never really being able to block off areas effectively - there is almost always a way in for a persistent opponent. It also looks great due to the colourful pieces. Blokus is absolutely the best four player abstract game I own - among the small number that scale up to four. Each piece is unique, and knowing when and where to play it is key to doing well. This is a fun, competitive game of limited resources (space) that everyone I've tried it on enjoys. My spacial thinking has never been better. One of my favorite games! Not much a fan of abstract games (although I play them more often lately) I was attracted to Blokus immediately because of the nice pieces. The game is different every time and requires another strategy every time. Demonstrated this game for Hodin at Spellenspektakel and it was well received there as well! Blokus is a great game for attracting newcomers to the board gaming hobby. It is visually attractive with bright colours and intricate patterns and it is possible to jump in and play with a minimum of instruction. I really like the spatial element of the game too - the way you have to block off opponents and utilize your pieces at the right time. A fun strategy game for the whole family, Blokus seems simple at first but has a ton of depth. The great thing about it is that you'll think you are doing great and then your kid will sneak in a surprise win! Blokus is a fun, quick game for all ages. It's like Tetris against other people and plays on spatial relationships. It has nice, translucent game pieces and a nice ridged board to keep the pieces from sliding around.